Smoking volcanoes, devastated towns, leech infested forests, endless breathtaking landscapes, and the beautiful but often highly endangered plant species of South America greeted the team from Wakehurst Place, Kew’s country estate in West Sussex, the Forestry Commission's Bedgebury Pinetum and Westonbirt Arboretum. Jo Wenham, Plant Propagation and Conservation Manager at Kew’s Wakehurst Place takes us on a journey of modern plant exploration. In March 2009 the team set off to explore Chile’s southern temperate forests hunting for rare and endangered species. The team, lead by Jo Wenham and Pedro Leon, Curator of the INIA Seed Base Bank in Chile, and made up of Dan Luscombe, Assistant Curator at Bedgebury Pinetum, Chris Stubbings a horticulturalist at Wakehurst Place, and Ben Jones from the tree team at Westonbirt Arboretum. The three week trip was the culmination of months of preparation in the UK with a focus on collecting in the temperate and coastal areas around Valdivia and northern Patagonia including the privately owned Park Pumalin. The expedition team climbed mountains and volcanoes, crossed rivers, and collected by boat in a fjord surrounded by dense temperate rainforest while dolphins and sea lions swam alongside the boat - amazing memories never to be forgotten. The search started in the coastal areas around Valdivia where many unusual species were collected, such as Luzariaga radicans, Embothrium coccineum, Aextoxicon punctatum, Podocarpus nubigenus, Amomyrtus luma and A. meli (both in the Myrtaceae family and the Chilean equivalent of Eucalyptus with smooth grey and peach-coloured bark). 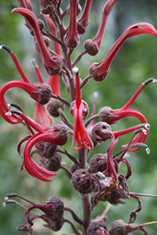 The team revelled in the vivid red flowers of Lobelia tupa and the lesser-known Lobelia bridgesii; both highly irritant and pollinated by hummingbirds, which were later also seen feeding in huge numbers on Fuchsia magellanica. In total 95 collections – made up of over 500,000 seeds - were made. The majority were destined for long-term storage in the underground vaults at the Millennium Seed Bank, which has recently achieved the milestone of banking over 10 % of the world’s known flowering plants. Some of the seeds will be grown at nurseries and displayed in the collections of the gardens involved. The fascinating species collected included: Nothofagus dombeyi, Myrceugenia colchaguensis, Gevuina avellana, Prumnopitys andina, Embothriums, Droseras, Puya, Gunnera and Griselinia. Some of the seeds have now started to germinate, including some of the 3,500 seeds of Araucaria araucana collected from 10 individuals from the genetically unique coastal population in Nahuelbuta National park. This beautiful tree, first spotted by the team on the edges of Conguillio National Park, where its dramatic silhouettes dominates the horizon, are at risk from fires that threaten the park from nearby plantations of Eucalyptus and Pinus radiata. As we are all too aware some areas of Chile have been heavily deforested. Alerce (Fitzroya cupressoides) forests, in particular, have been heavily logged and are now severely degraded secondary forest. The team attempted to collect seed from a specimen aged over 3,500 years (reportedly the oldest in the world and second oldest species in the world after the Bristlecone Pine) but it turned out to be male! Nevertheless 127,000 seeds were collected in the Ranco Province Monumento Natural Alerce Costero Park from over 100 individuals. The team also trekked for 12 hours up an old buffalo logging track in Huinay in Northern Patagonia to find another population of Alerce. Here it was growing in much denser forests with Nothofagus betuloides, Azara lanceolata and at lower altitudes with the beautiful Asteranthera ovata (a stunning climber with hot pink flowers clambering up the rainforest trees). It was then onto Huinay where the group were accommodated by the Huinay Foundation whose territory covers nearly 34,000 hectares in the Lake District region of Chile. Lying between the Comau Fjord in the Province of Palena and the Argentine border the foundation’s purpose is to facilitate ongoing scientific research and preserve the biogeographical heritage of Huinay. The team shacked up in a beautiful wooden stilted building set next to the fjord with glacial-tipped mountains in the background that are covered from top to bottom in lush temperate forest. Arriving at the facility after a tiring 10 hour drive and hour speedboat ride in complete darkness and lashing rain it was breathtaking to wake in the morning and be greeted by a jaw-dropping view from the balcony. A day was spent traveling the fjord by boat collecting Gaultheria mucronatum, Coraria ruscifolia, Pseudopanax laevigatus and Hydrangea serratifolia, among others, with dolphins, sea lions and sea otters for company. Could it get any better? Next stop was Caleta Gonzalo in Park Pumalin, now privately owned, which in 1991 was bought by the American Douglas Tompkins with the vision to set aside 42,000 acres of evergreen temperate rainforest and save it from possible exploitation. The Conservation Land Trust has added another 700,000 acres of almost intact primary forest and this area was declared a natural sanctuary in August 2005. After a ride in an old van over bumpy ground and onto another boat, while black vultures circled above, the team, now joined by Marcos and Marcelo from the INIA seed bank, joined the park manager at Pumalin, Dagoberto. Throughout the trip the hospitality was overwhelming, especially at the Huinay station, and the staff at Park Pumalin continued to amaze by providing idyllic wood cabins at Caleta Gonzalo (commonly known as Cabanas in Chile), two personal guides, and two 4 x 4s. Although remote, Park Pumalin is usually accessible by road (through Argentina) but the team had to use a boat as the road was too dangerous after the Chaitén Volcano erupted. The volcano entered a new eruptive phase for the first time in about 9,500 years on the morning of May 2, 2008 and the Chilean government evacuated the nearby town of Chaitén, 10km away, and the surrounding area the same day, as the plume of ash from the eruption spread across Chile and Argentina to the Atlantic Ocean and coated the town of Futaleufú (75 km southeast). Chaitén, destroyed by the volcanic eruption, became the new place for plant hunting. This ghost town, once inhabited by 4,200 people, now reduced to just 50 with only one shop (that only supplied water, tinned food and toilet rolls). A local lady kindly gave the team lunch and the view from the window was one of total destruction. The river in the foreground had assisted in the volcano’s total devastation of the town. The team drove through the town, houses strewn about the river, deserted playgrounds layered in grey ash with the ever-lingering threat of the volcano in the background. But it wasn’t in vain: two very rare conifers Pilgerodendron uviferum and Austrocedrus chilensis were collected in this area. The destructive and unpredictable nature of Chile’s natural wonders has and will continue to shape the dramatic landscape and this was never more evident than when the team drove through a moonscape, with monkey puzzles and Andean condors circling, surrounded by three volcanoes. Only three weeks after the team returned home the Llaima (one of the three volcanoes) erupted, closing the National Park and showing how delicately balanced, but resilient, these species and habitats are. UK: 10 % of the World's Seeds Banked! Kew's Millennium Seed Bank partnership is today celebrating a major landmark as Musa itinerans - the threatened Yunnan Banana from southwest China - becomes the 24,200th plant species to take up residence in the world's largest ex situ conservation project.